We can learn a lot about a piece without even playing a single note of it. A musical score may look like it’s full of secrets, but we can uncover the secrets if we look carefully and think about what we see. Descriptive words in the music, such as leggiero, marcato or con fuoco. Overall dynamics. Where is the loudest part, the softest part? Is the piece mostly loud, mostly soft, or constantly changing? Which rhythm patterns does the composer use more than twice? Is there a rhythm pattern that only happens once? Is there a rhythm pattern that looks confusing? Write in the count. Start with the simplest part of the measure—the first count, for example, or any long note. Write in the counts for that part; once you’ve done this, you can probably figure out where the remaining counts go. Which hand plays the melody? If there is more than one line, or voice, played by one hand, which voice is more important? Where else can you find this melody in the piece? How many times? Does the melody move mostly by skips or by steps? Do you see a scale, chord or arpeggio that you recognize? Is there any melody that happens only once? Do both hands ever play the same thing? What’s the highest melody note in the piece? The lowest? What is the first note in each measure? Look at the downbeats of four measures in a row. Do you see a pattern? What interval is used most often? Least often? Do you recognize any chords? Does the accompaniment ever look like a melody? How many measures does each phrase contain? What is the highest melody note in the phrase? The lowest? Watch Nancy O’Neill Breth demonstrate decoding a musical score. Sight-reading music is different from practicing or performing music. The goal in sight-reading is to capture as much of the music as possible without stopping. In sight-reading you are allowed to leave out notes, or one hand, or even an entire measure, but you must keep the beat going. The best way to become a good sight-reader is simply to do it every day. Here are some hints to help you. Take it Easy. The biggest mistake people make in sight-reading is using music that is too difficult. Use only pieces that are at least one level below your normal level of repertoire. Keep Going. We all hate wrong notes. But when you are sight-reading, if you make a mistake and then stop to correct it, you have made two mistakes, not one. Promise yourself that you won’t lose a single beat from beginning to end. Turn on the metronome. Pretend the metronome is your duet partner. Since it never stops, you can’t stop either! Make Sense. Group the notes and musical ideas together. When you read a book, you don’t spell out each word letter by letter, so don’t sight-read note by note. To make this easier, examine the piece before sight-reading it to discover patterns that you recognize. What key is it in? What chords or scales look familiar? Are there any repetitions? Look Around. Increase your field of vision: Fix your eye on the tempo mark of the piece. Play the first line of music, keeping the tempo mark in your peripheral vision. When you can do this easily, try two lines. Play an entire piece without taking your eyes off the music. Count. Find every spot in the music where the rhythm looks tricky. Clap or tap out the rhythm of each spot, counting aloud. Tap with both hands to show RH and LH parts. Or do this throughout the whole piece. When you play, count aloud. Cover Up. You will need a partner for this. Ask your partner to cover a measure as soon as you have played the first note of it. Repeat on every measure as you play through the piece. When your partner isn’t there, see if you can still keep your eyes one measure ahead of the measure your hands are playing.sight-reading check list. Or, if you don’t have a partner, but you do have an iPad, try this excellent sight-reading app: Read Ahead. Keep Score. Give yourself 4 points for perfect continuity, 3 points for perfect rhythm, 2 points for perfect notes, 1 point for dynamics. A perfect score is 10. Anything between 8 and 10 is very good. If you get a score of 5 or below, that’s a poor score. Sight-reading is just that: sit down, open the book, and play the piece–as we say, read the music at sight. The goal is not to play perfectly. The goal is to capture as much of the music as possible without stopping. Many piano students spend all their time learning pieces and none of their time sight-reading. 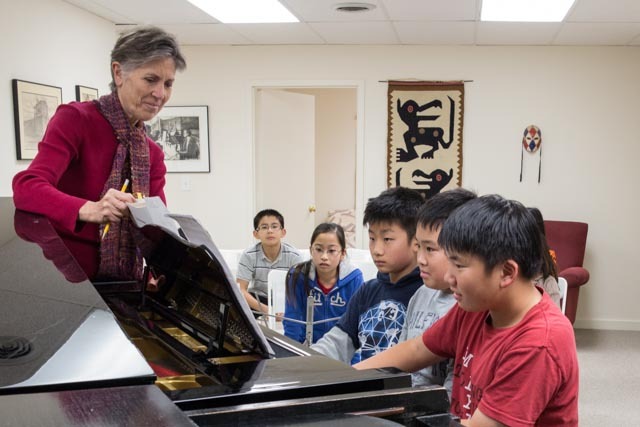 When they finish lessons and become busy with other parts of life, they find that even though they might remember a piece or two from a recital, their reading skills are too poor to learn new music. Over time, they may lose their piano skills completely. Don’t let that happen to you! Sight-reading requires a whole different set of skills than what we use when learning a piece for a recital. And sight-reading has to be practiced–every single day. There are tricks to becoming a good sight-reader. Make a mental check list to help you. For example, here’s a cartoon you could use. Tempo: The title or tempo marking may describe the mood. Patterns: big patterns, like overall structure; little patterns, like repeated measures, familiar chords, scales. Odd things: a big leap, a double-sharp, a strange chord, an unexpected rest, or anything that only happens once.